Become active with your Iowa AEYC membership! The Iowa Association for the Education of Young Children (Iowa AEYC) is a state affiliate of the National Association for the Education of Young Children (NAEYC). Our Iowa state affiliate is comprised of 14 chapters that cover the entire state of Iowa. A chapter structure enables all of our members to network and learn with other early childhood educators living in their same or neighboring communities and opportunities to get involved in the issues affecting the state and the counties. Local chapters focus on serving members in the local communities where early childhood professionals live, work, and learn. 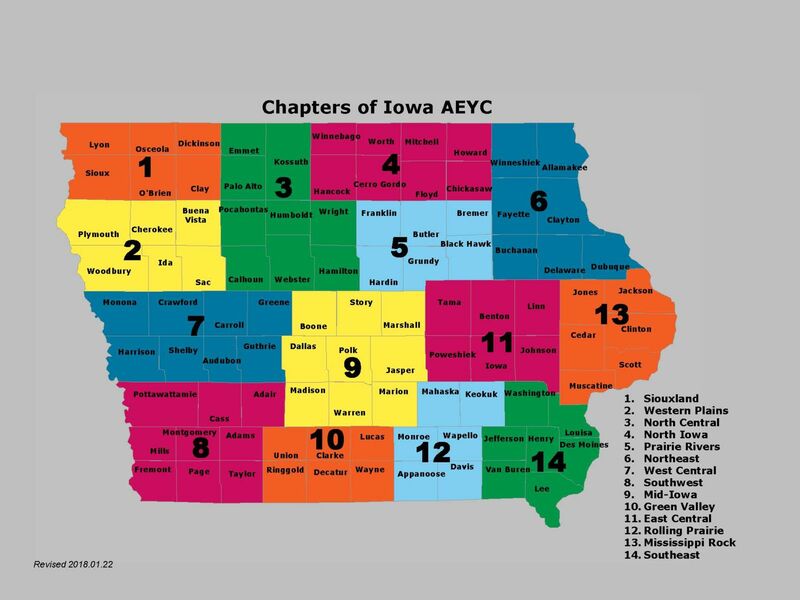 As our local chapters notify us of their upcoming events we share those events with you on the Iowa AEYC Calendar and the appropriate chapter's webpage. Click on any of the local chapter links above or to the right to see what may be coming up.